I wasn’t going to admit it. The whole idea goes against my purist nature. But the circumstances beg disclosing the truth. So here goes. For the last three days, we have gotten rides the final few miles to our destination. Yes, we took the sag wagon. Arriving on the edge of Portland, despite having over 50 hilly miles behind us already, we decided to push on and cross the city. We knew that Portland was bicycle-friendly, and we found the Springwater Corridor Trail to be a fabulous way to traverse the city. Not only was it a smooth and protected trail, but at each intersection the cars all stopped to allow us to cross. We were really impressed. There were plenty of other cyclists on the trail and when one asked us about our trip, we struck up a conversation and cycled together for several miles. Unsure of how to find our bridge across the river, our new friend Doug immediately offered, “Here, follow me.” It just so happened that his house was en route to the bridge, and Doug invited us in for a cold drink. 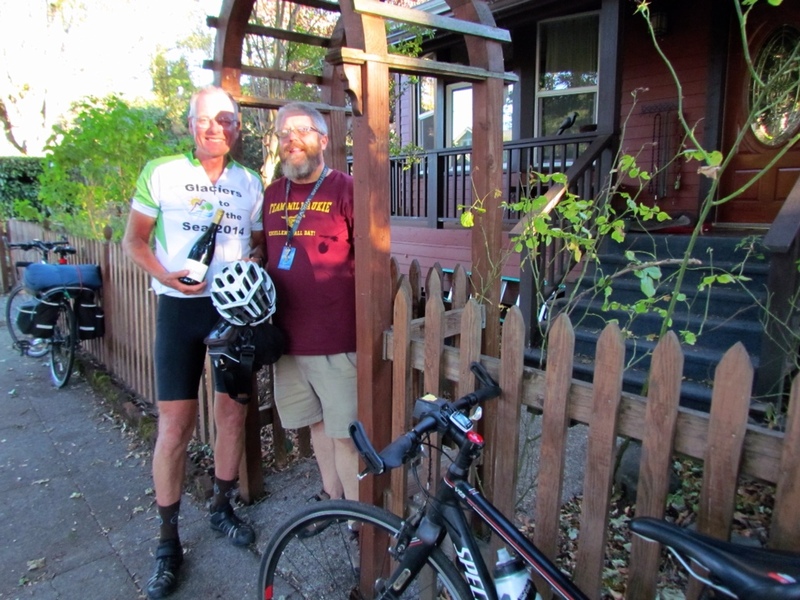 It didn’t take much encouragement, and we enjoyed extending the visit and sharing cycling stories. 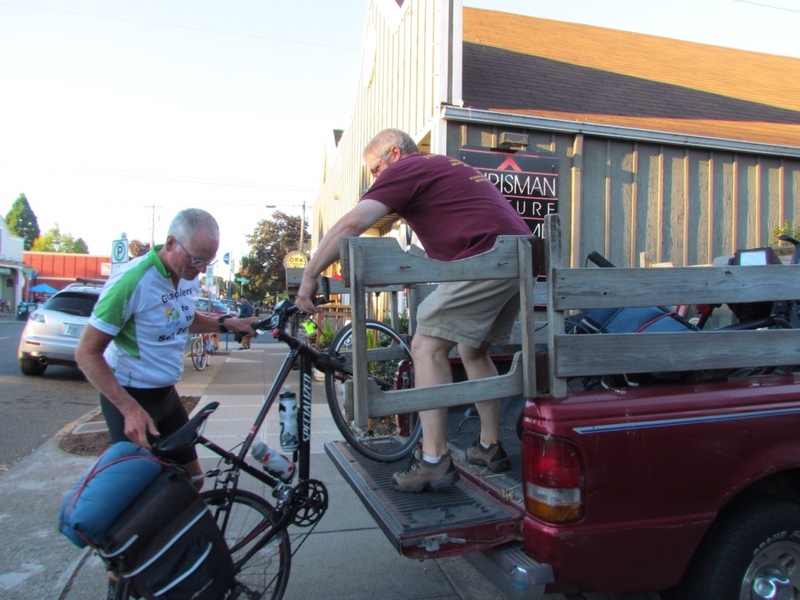 Doug expressed concern about the route to reach our motel due to construction, heavy traffic and steep hills. Before we knew it, he’d convinced us to let him take us and our bikes to the motel. I felt pretty sheepish until we actually drove the route, and I saw the shoulderless passages and narrow lanes. He was right, we were a lot safer in his truck. Not only were we extremely grateful for the lift, but our day was greatly enriched by meeting such an engaging fellow cyclist. 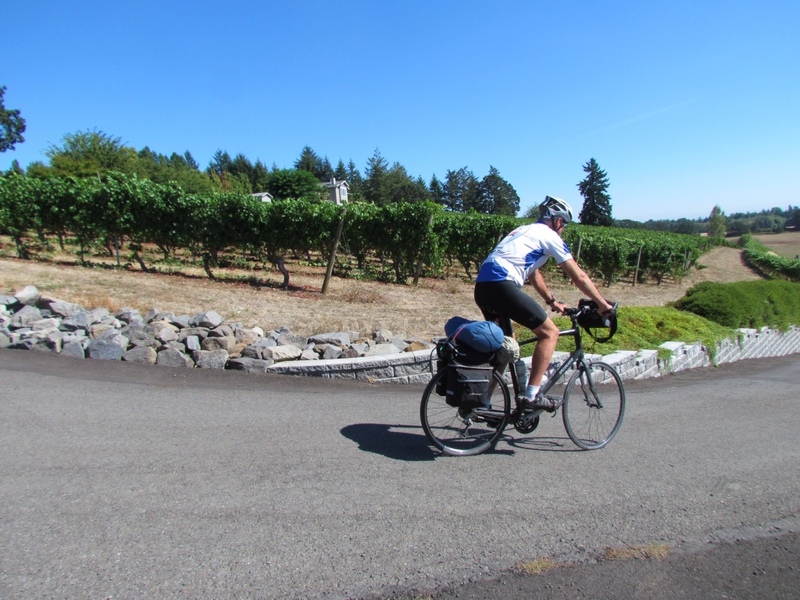 It was a fun day of cycling through the wine country south of Portland. I finally got my chance to visit a vineyard when we found one just a short distance off the road. It was a small family affair, and we enjoyed taking to the owner as well as learning about their operations. 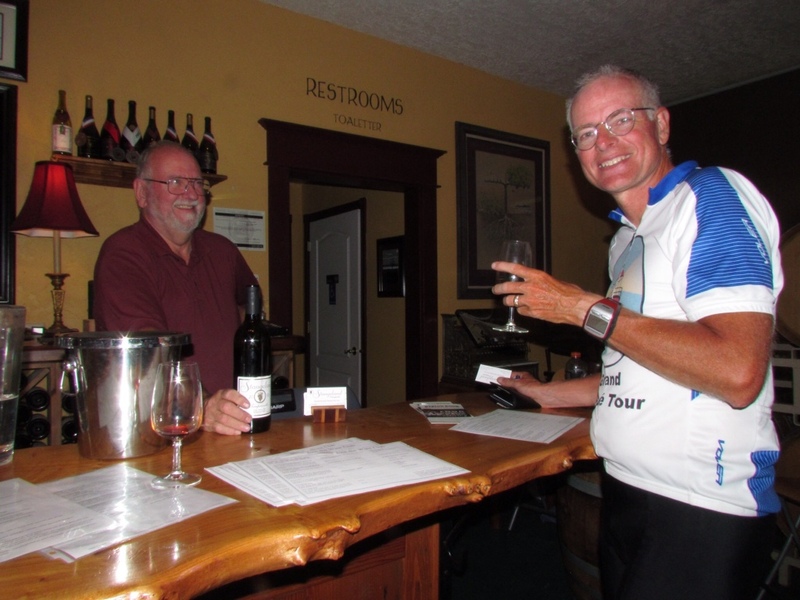 We had small samples of just a few wines, knowing we still had many miles to cycle, but managed to arrange to ship a case back home. How could we resist when the grapes were from the Eola-Amity Hills? While we were at the winery, the temperature soared into the 90s. In that heat, we were eager to reach our host home for the evening. With just two miles to go, we were dismayed to find a roadblock with local police redirecting traffic away from a brush fire. Faced with a six mile detour, we had just decided to wait for the road to reopen, when a car stopped in front of us. The driver got out and announced, “Hi, I’m Curt, your host for the night!” Discovering the roadblock, he had come to our rescue and whisked us off to his house. Talk about great service! 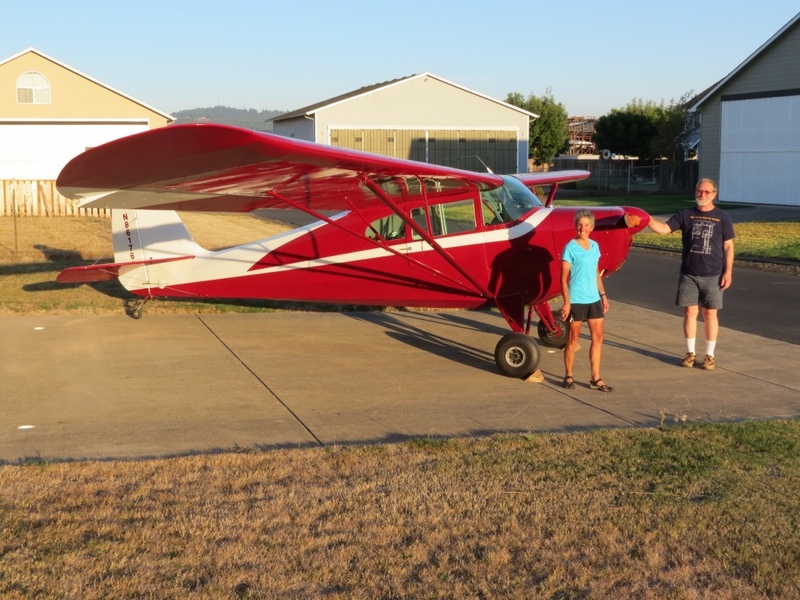 Curt and Barbara live in an airpark, but that didn’t mean anything to me until they gave us a tour of their house. I was totally unprepared to learn that the large structure behind their house was an airplane hangar! In fact, the street behind their home wasn’t for cars at all – it was a taxiway for them and their neighbors to get to the airstrip at the adjacent airport. Curt graciously rolled Barbara’s airplane outside so we could get a picture of it. That led to chatting with several neighbors, and getting a peak into their hangars as well. Not only are these folks avid pilots, but they all share a passion for building their own airplanes. Imagine! It was all fascinating to us. This is day 17 of our trip, and we have cycled every day so far. We are due for a rest day. It’s no coincidence that we plan to take a couple of days off in Eugene, as Rich’s brother Stewart and his wife Kathy live here. They happen to live at the top of a very steep hill (a 20% grade with roads that go straight up) and we were instructed to cycle to a park in town where Stewart would come to collect us. So our rest began we even finished our day’s journey. I may bristle at the idea of sagging. But the demonstration of hospitality and kindness in each case has led to great experiences. Sometime it’s worth letting up on one’s principles. Even to sag. 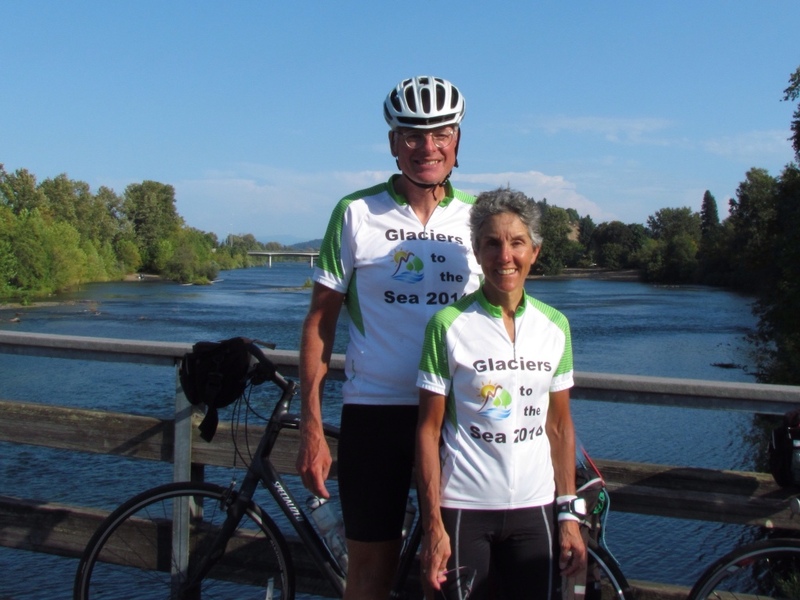 This entry was posted in Keeping Fit, Travel and tagged Cycling, Cycling Trip, Glaciers to the Sea, Travel by Molly. Bookmark the permalink.